Recently, and against the backdrop of a serious head injury that occurred during the 2018 Ryder Cup, the health and safety agency Protecting.co.uk suggested that golf should go the same way as cycling, with participants wearing protective head gear. It even stated that some businesses are lobbying for this change to take place. 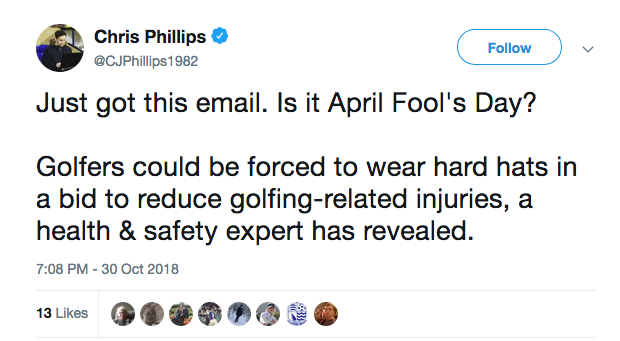 ‘Far from an interesting addition to golf’s already-notorious fashion rules, the move could help curb the number of injuries occurring as a result of the game – with figures showing that golf is statistically more dangerous than rugby,’ stated the company. 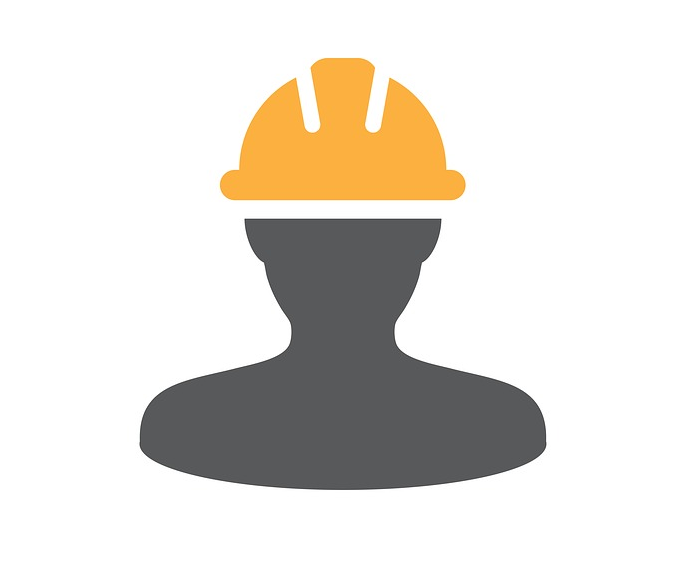 ‘A number of insurance companies and private businesses are seeking to reduce the financial burden of golfing injuries by pushing for greater protection for players – including wearing hard hats or helmets. ‘With statistics suggesting that between 16 and 41 per cent of amateur golfers are injured each year, the potential for working days lost to golfing injuries is high enough to prompt businesses into lobbying for improved safety measures. 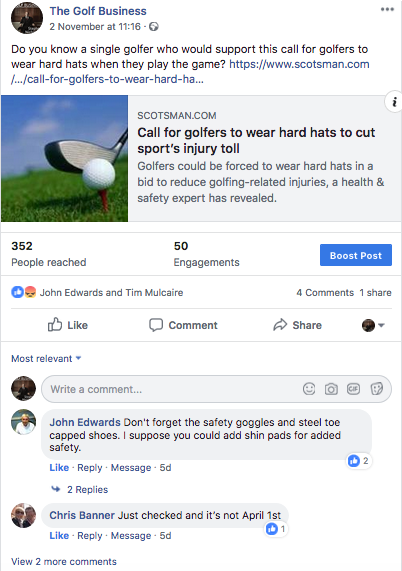 While Protecting.co.uk quoted two golfers, David Adams and Tony from Leeds, who support the move, golfers online seem to have a different idea. 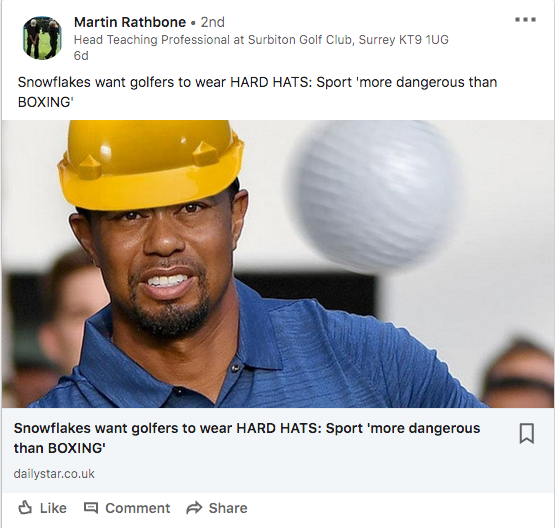 The Golf Business could not find a single comment on social media or in response to various publications’ articles about the story that supported the move. Thomas Tutone said it was a “preposterous suggestion”, John Edwards wrote: “Don’t forget the safety goggles and steel toe capped shoes. I suppose you could add shin pads for added safety”, and Michael Mulgrew Senior added: “I hope it’s a wind up”. Many who work in media who received the press release thought it was an April Fools’ Day joke. However, Chris Hall, a spokesperson for Proecting.co.uk, defended the statement: “If you look at a selection of other sports played in the UK, both contact and non-contact, there are measures in place to reduce injury,” he said. I have always used the term helmet golf when playing tight golf courses or criss crossing fairways but this is a bit extreme Alistair. Thank you for sharing. Where did they get their stats on injuries from? Using their figures & projecting them on to the number of participants, hundreds of thousands of golfers are injured each year……. If the helmet has air con, windscreen (and wipers), and a nose wiper included I am definitely going to wear one.